The standard Mercedes-AMG GT Roadster is hardly lacking in power, with 476PS from its 4.0-litre twin-turbo V8. But if that’s too puny for you, how about another 81PS and an extra 50Nm of torque? 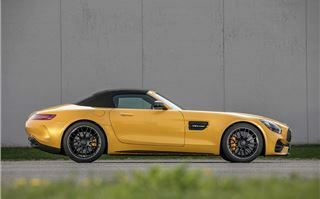 That’s the chief improvement if you opt for the wider, more aggressive, 557PS Mercedes-AMG GT C Roadster. It isn’t just more powerful, though. 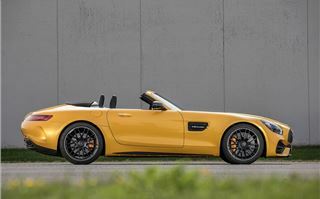 The C gets rear axle steering to improve stability, a different locking differential that’s faster to react, adaptive suspension plus an extra ‘Race’ driving mode, if you want to go on a track day. Performance is improved too – 0-62mph takes 3.7 seconds, down from 4.0 seconds, while top speed is a massive 196mph. The price for all those improvements? An extra £28,500. Not exactly a bargain – but the tweaks are quite obvious almost immediately upon taking to the road. The GT C has better steering feel and – thanks to the rear wheel steering – it’s easier to place, both at low speeds and when driving quickly. The extra performance is immediately obvious, too. That’s because it’s spread across a broad spectrum of the rev range. So even if you’re lazily pootling along the road in the Comfort drive mode, a flex of your right foot means a massive surge of acceleration. Pick a sportier mode – or use the paddles to drop a few gears - and the GT C Roadster is savage, with relentless pace and an incredible sound track. A variable exhaust system means that, in Sports+ mode, there are cracks and bangs to accompany the wonderful V8 growl. It’s one of the best sounding cars on sale and its handling doesn’t disappoint either. There is a huge amount of traction through corners and body control is fantastic, meaning there’s barely any roll and things stay stable even on less than smooth road surfaces. It's not perfect though. If we’re nit-picking, the steering feels ever-so-slightly on the light side and doesn’t give as much sense of accuracy or precision as you’d get in, for example, a Porsche 911 Cabriolet, despite the immense grip. Low speed ride quality isn’t great either, with the car jiggling a little in town and thumping over some road imperfections. It’s very wide, too – so bay parking is a pain. It’s also worth remembering the Coupe. 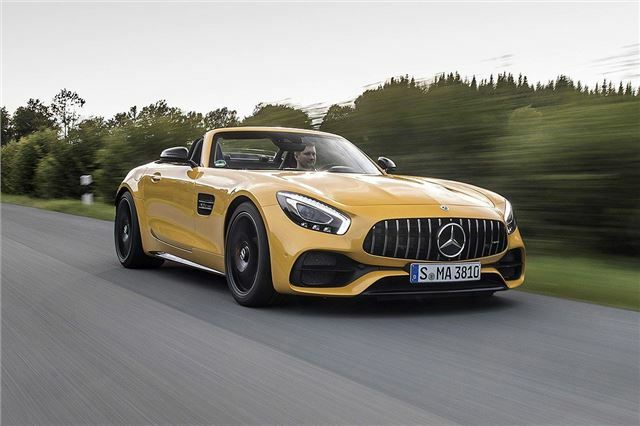 The stiffer, hard-topped car feels more poised, accurate and simply more like a sports car than the slightly softer Roadster, so is a better bet for real driving enthusiasts. The differences are surprisingly slight though - and to be expected. The trade-off for picking the Roadster is, of course, the open sky and better access to that wonderful exhaust note. The roof itself is fabric and folds electronically in 11 seconds. It can be operated when driving at up to 31mph – so you don’t need to pull over if it starts raining. With roof in place refinement isn’t too bad – although obviously it’s not as quiet as the coupe. With the roof down, buffeting isn’t much of a problem and wind noise is surprisingly well-suppressed even at high speeds. The roof folds into its own area, so boot space is the same regardless of whether it’s up or down. That’s fortunate, because the load area isn’t very big at all at 165 litres. That’s tiny even by small hatchback standards, while the space itself is shallow and wide. Large cases won’t fit – so for weekends away you’ll have to take soft bags. Being a roadster, there are only two seats but cabin space isn’t bad at all. Tall occupants will be able to get comfortable without too much difficulty and the driving position has plenty of adjustment, with power seats and a power steering wheel. There are a couple of cubby holes too, so you can keep odds and ends like phones hidden out of sight. Build quality is very good, with lots of nice detailing in the cabin including metal dials and buttons, plus creature comforts like an easy-to-use infotainment system. There are a few areas that could be improved, though – including the switch to fold the roof down. It feels cheap and flimsy, which is a shame since it’s likely to be operated quite regularly – especially considering the channgeable weather in the UK. 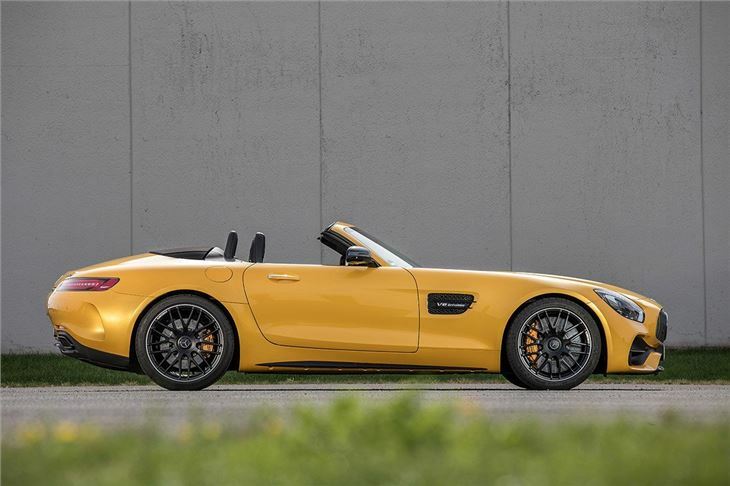 Finding things to fault with the Mercedes-AMG GT C Roadster is difficult, though. It looks great, sounds great, has fantastic handling and provides superb performance – but it’s quite a lot more expensive than the regular GT Roadster. Still, the extras on offer tighten up the car and provide appreciable extra performance, so if you’ve got the cash, go for it. You won’t be disappointed.